The “Ovidiu Sincai” Social Democratic Institute Foundation is a non-profit organization that has received legal status on 4 June 2002. The foundation has been established in the will to support the process of modernizing doctrine, of strengthening and developing democracy in Romania and the world and also with the goal of organizing more efficiently the educational and specialization activity of human resources. 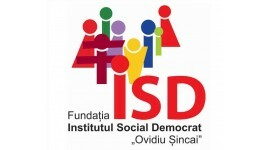 The “Ovidiu Sincai” Social Democratic Institute was created under the aegis of the foundation and prioritizes the achievement of the following objectives: it designs and unfolds activities of doctrine and programmatic elaboration; it edits scientific and political papers and materials; it also functions as a think-tank for governmental institutions and political organizations; organizes activities of education and professional training; cooperates with similar institutes from within the country as well as from abroad; offers scholarships to youth preoccupied with studying, promoting and upholding the values and the institutions of democracy. The activity of the Institute is structured along four departments: Scientific Research, Analysis and Prognosis; Education; International Relations; MondoMedia Editorial Group. The “Ovidiu Sincai” Institute Foundation is engaged in unfolding research activities on political and socio-economical topics of the Romanian society. Another research objective is the study of European and global phenomena that affect the contemporary world and for which we have the aim of finding solutions within a social-democratic approach. The “Ovidiu Sincai” Social Democratic Institute Foundation places a particular emphasis to the dialogue with representatives of the civil society. This is the reason for which the Institute periodically organizes seminars, conferences, roundtables, meetings and debates focused on issues of utmost importance, with national, European and international impact. The Institute organizes symposiums on themes of national interests, to which representatives of mass media, opinion leaders, as well as the personalities of the Romanian political, cultural and economic life and important foreign political personalities are invited. In this context a presentation is made of the difficulties confronting the present-day Romanian and European society and methods for an efficient resolution are proposed. Periodic meetings with the members of the European and worldwide democratic foundations and institutes were designed by the “Ovidiu Sincai” Institute Foundation with the purpose of mastering democratic values, as well as in order to strengthen the personal relations among the leaders. For creating a more efficient environment in the relations with foreign foundations and institutes, the “Ovidiu Sincai” Institute has set to sign collaboration protocols with such organizations. The “Ovidiu Sincai” Social Democratic Institute unfolds an ample activity of educational training and formation for those interested in the values and principles of democracy, aiming at contributing to the professionalization of the Romanian political class. In the autumn of 2002 the Institute has created the “Ovidiu Sincai” School for Post-University Academic Studies, which is its most comprehensive educational project. By training the youth in “Political Management” it aims at instilling the knowledge and mastering of the values and principles of democracy, thus supporting the complex process of doctrinal modernization in Romania, of making the political class more efficient and professionally competent. Beginning with June 2004, the Institute organizes the “Ovidiu Sincai” European School under the aegis of the Council of Europe. The School belongs to the Council of Europe’s Network of Schools for Political Studies. It annually reunites 30-35 participants selected from a wide spectrum of the civil society. The main purposes of this school are the education of young politicians, of decision-makers in Romania, in the spirit of the European democratic practices and the relations between representatives of different social groups. The third direction of the Institute’s educational activity is called the ISD Education Workshops. The workshops dealt with issues such as: communication techniques; negotiation methods; communication in crisis situations; conceiving and unfolding an imagery strategy for institutions and organizations. The “Ovidiu Sincai” Social Democratic Institute is unfolding an editorial activity focused on political and socio-economic themes. Under the aegis of the Institute, through the MondoMedia Group, are published the Agora Social-Democrata and Sinteze magazines as well as a weekly Newsletter in Romanian, which comprises the main activities of the Social Democratic Party at central and local level. The “Newsletter” presents the governmental actions, as well as those of the representatives of the prefectures and municipalities. For a thorough information of the members of the Social Democratic Party, the Institute also publishes a Political analysis bulletin, which encompasses studies on the main current Romanian and international political and social issues. Also, ideological contributions of social democratic personalities were edited.